Portions of this review also appear in our coverage of the standard Blu-ray release written by Luke Hickman. Specifically, Mr. Hickman penned the Movie Itself and Audio while M. Enois Duarte wrote new Vital Disc Stats, Video, Supplements and Final Thoughts sections. For a full in-depth review of the Blu-ray SDR HERE. While I enjoy the first two Alien movies, I'm no fanatic of the series. My opinion of Prometheus is based solely on Prometheus. If you still have not yet seen Prometheus, rest assured knowing that my review is mostly spoiler-free. I will not explain the reveals. Having seen the movie or not, if you know about Prometheus, you know that it is a prequel – of sorts – to the Alien franchise that Ridley Scott kicked off in 1979. The more you know about the Alien movies, the more that you will see it as a prequel – but if you know nothing about the franchise, if you haven't seen a single of the Alien or Alien vs. 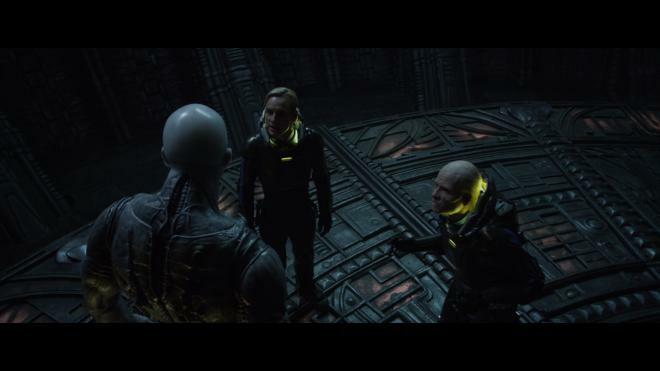 Predator movies, you can still watch 'Prometheus' and follow it with ease. It carries the ability to function as a 100 percent stand-alone film. Not a single element of Prometheus hinges on you knowing the Alien movies – but the more you know about them, the more you'll enjoy revisiting the franchise from an angle you've never considered. The story that belongs to the remainder of the characters is brilliant. Peter Weyland (Guy Pearce), the old tycoon who is funding Shaw's deep space mission, has sent a few of his own employees along with Shaw and her boyfriend. The most important and interesting of them all is David (Michael Fassbender), a humanoid robot. (If you know the Alien movies, then you know already know this type of character.) The story that David commands is not unlike that of Godzilla – man, or a robot in this case, is toying with science, unsure of what the consequences will be. When these two stories collide, Prometheus fires on all levels. 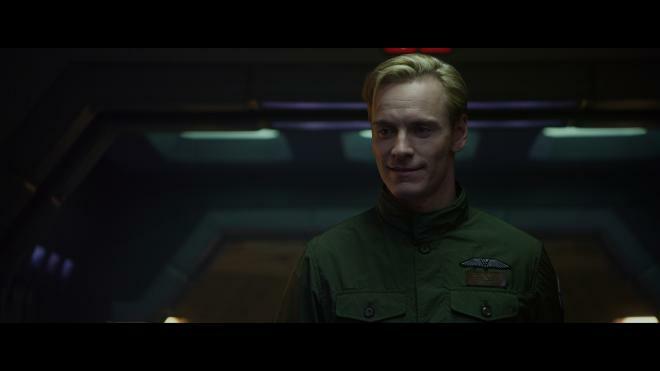 Four months after it's release, Prometheus is still sitting pretty with a 74 percent Rotten Tomatoes rating – but it seems to be pretty polarizing between those who like it and those who do not. While it's apparent that more people like it than dislike it, those who dislike it really dislike it. A few of my family members and friends who I thought would love Prometheus ended up hating it. A few who I thought would dislike it, wound up loving it. Knowing this, no matter how you perceive it prior to seeing, this is one of those films that you need to see for yourself because not a single person can judge how you're going to take it based on your taste and preferences. Considering how damn amazing this Blu-ray release is, you definitely deserve to give it a shot. 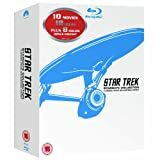 20th Century Fox Home Entertainment brings Prometheus to Ultra HD Blu-ray as a two-disc combo pack with a flyer for a Digital HD Copy, which can be redeemed via FoxRedeem.com but only available in HD SDR and HDX on VUDU. The dual-layered UHD66 disc sits comfortably opposite a Region Free, BD50 disc inside a black, eco-cutout keepcase. At startup, the UHD goes straight to a main menu screen with full-motion clips, the usual options along the bottom and music playing in the background. 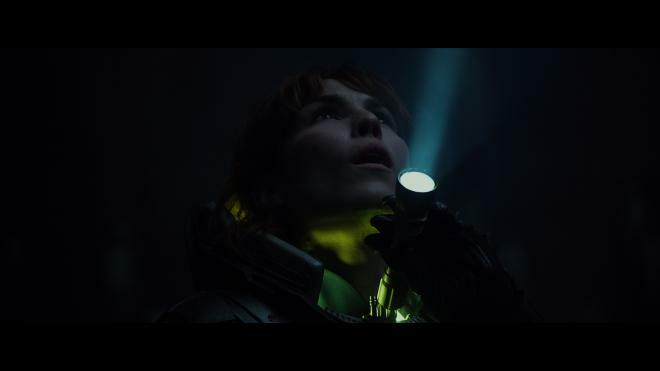 Prometheus wanders about Ultra HD with an excellent and often beautiful H.265 encode that leaves the HD version stranded on a desolate planet. Immediately, in the opening shots of an alien drinking the dark liquid, the picture is noticeably brighter and more dynamic, showing better contrast than before. The edges of clouds seem to glisten and radiate from the sun, the foam of the roaring waters sparkle and the white body of the Engineer appears more true to life. Specular highlights are also a bit more intense, providing a realistic sheen around the edges of the counters aboard the ship, the various weapons and along the moist walls of the damp alien spacecraft. However, it doesn't quite compare to some of the best we've seen of the format, occasionally showing a bit of blooming around the brightest spots and the many light sources, engulfing some of the finer details. Black levels, too, are significantly richer and more luxurious with inky, Stygian shadows penetrating deep into the screen, adding some appreciable depth. But often those darker areas tend to slightly crush the tiny objects and specifics in the background, and there doesn't seem to be much gradational difference between the shades. The movie was deliberately shot with a limited teal-orange palette that makes much of the 4K presentation appear monochromatic and grayish. Nevertheless, the colors have been nicely touched up, largely looking a bit more luminous and resplendent, especially in the primaries. The greens and reds of computer monitors, for example, shine with a more realistic intensity, giving the holograms a believable 3D effect. The various shades of blue are arguably most impressive, looking more metallic in the Engineer technology while the interior of the Prometheus ship is immersed in a dull, droning bluish light, and Vickers' outfit comes in a noticeably darker shade. The secondary hues probably benefit the most from the jump to UHD, such as the vibrant yellow glow of the helmets worn by the expedition team and the subtle hints of purple and pink inside Shaw's quarters. The gray of the Engineer's head has a bit more pop to it, and the sand surrounding the alien temple actually looks like brown dirt. Shot entirely on Red Epic camera system with a max resolution of 5K and later mastered in a 2K digital intermediate, the 2.40:1 also receives an appreciable uptick in definition and resolution. Not only do facial complexions appear much healthier with a rosier glow around the cheeks, but faces are also highly revealing with better, more lifelike textures during closeups. Bright scenes aboard the ship or inside the temple are very detailed, exposing the intricate design and individual components of either. Viewers can better make out the stitching of the outfits and the fact that some are made of different materials. Sadly, there are a few softer moments, mostly related to the CG imagery, and various instances of very mild aliasing along the sharpest edges, which is likely the result of an upconversion from a 2K source. Thankfully, it's nothing too egregious or frequent to ruin the overall quality of an otherwise excellent 2160p video. For this 4K presentation of Scott's prequel, 20th Century Fox has opted to recycle the same, reference-quality DTS-HD soundtrack enjoyed on the 2012 Blu-ray, and Luke did a great job detailing what makes it such a thrilling listen at home. The following is from his review of the audio. 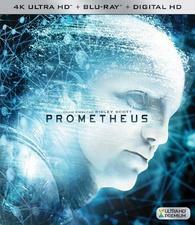 If I could give Prometheus 7.1 DTS-HD Master Audio track a rating higher than 5 stars, I would. Hearing it cranked up on a 7.1 system, I heard sounds that I never recognized during my theatrical viewings. The first time I screened Prometheus, I was immediately reeled into the film by the beautiful score overlaying breathtaking landscapes during the opening credits. Hearing the score via this mix is just as wowing. It establishes a grand tone equal to that of the movie that you're about to see. 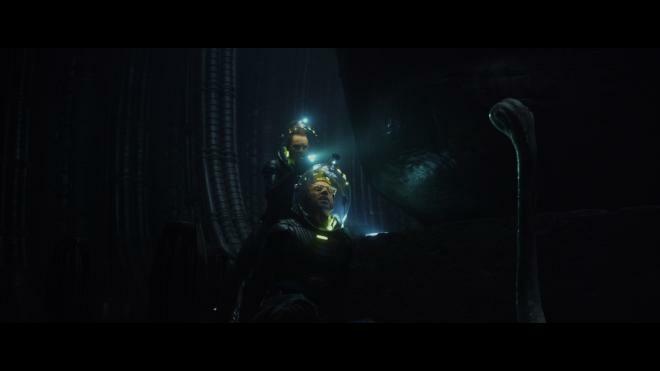 If you can't watch Prometheus with the audio cranked up because the kids are in bed, don't watch it. This lossless 7.1 mix deserves to be heard as loudly as possible. Audio Commentaries: A pair of commentaries kick off with director Ridley Scott explaining how this project fits in the franchise, the challenges of making the film and his creative decisions while also tossing in a few anecdotes from the production. The second track features an amusing conversation with writers Jon Spaihts and Damon Lindelof discussing the plot, some of the details that went into creating this storyline and various other themes. Watching [Prometheus] itself is a journey that I wish I could take again for the first time. Upon reflection and analysis, it only gets better with each viewing. 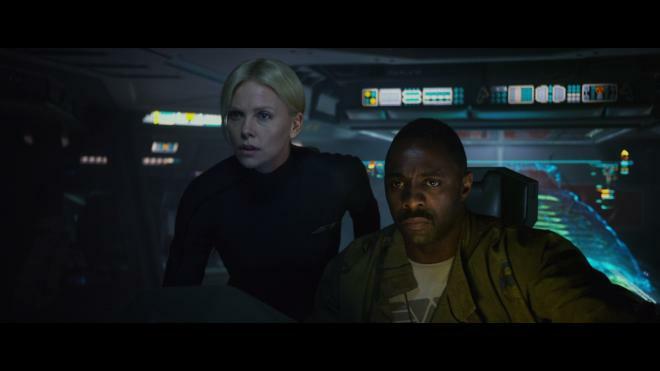 Sure, there are those who loathe Prometheus – and I've carried on extensive debate-like conversations defending the arguments – but I stand by my opinion that this is one of the very best contemporary science fiction films, a more-than-worthy chapter in the Alien-verse. The Ultra HD crash lands into home theaters with an excellent 4K video presentation that easily surpasses its Blu-ray SDR counterpart, and it comes equipped with the same, reference-quality DTS-HD soundtrack, although having that too upgraded to either Dolby Atmos or DTS:X would have an outstanding touch. The same set of supplements are ported over and don't really add a great deal, but the overall package is definitely for those loyal to this prequel installment and those hungering for more HDR goodness.